Some songs sound so authentically retro, that they lose a part of their modernity. “Bending Over Backwards” by The Wandas is a song that knows exactly how to balance the two ends of the spectrum. With a guitar driven melody, snappy lyrics, smooth sailing chorus, and commanding bridge, “Bending Over Backwards,” is a tune that perfectly straddles the modern-retro sound. The Britoons: Fictional Retro – Pop At Its Best. The Britoons are not a real band. But that doesn’t mean their music isn’t real, or really well done retro-pop. The film is set in the late 1950’s when pop acts took over the stage from vaudevillian performers. The movie’s soundtrack includes three songs by The Britoons but it is “My Girl Blue,” that stands out as what could pass as a legitimate retro single. 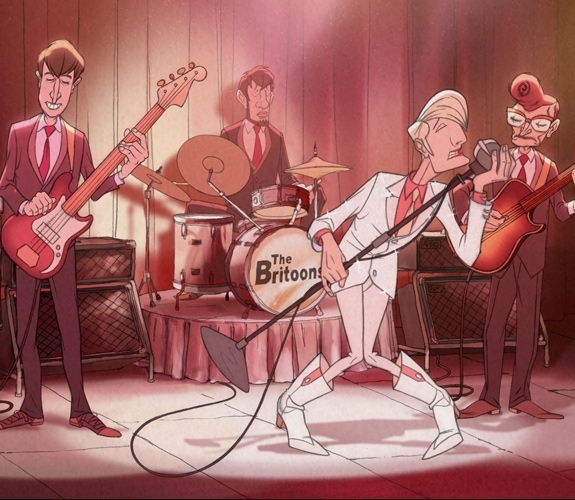 With a swagger of Elvis Presley and a heaping dose of early 60’s Gene Pitney a la “A town without pity,” The Britoons croon their way into fictional band history. But more importantly they make one wish they were real. Hoping and Praying You’ll Check Out The School. No other current group manages to consistently evoke the playful, girlish pop of the 1960’s than the British seven piece band The School. Creamy harmonies, and jangly percussion help draw comparisons to Dusty Springfield’s albeit slower, but similar “Wishing and Hoping.” Though the messages of both may differ,it is impossible to not connect the two songs. Liz’s quiet and coy vocals teamed with sporadic handclaps and wistful lyrics, help cement the tune and The School itself as a band one can only hope finds its way into one’s music collection. Soulful crooning and achingly real lyrics, help make Liam Bailey’s “It’s Not the Same,” a song that once heard cannot be simply forgotten. Bailey’s smooth bluesy vocals sail over the slow percussion driven tune. As he sings “Where does the time go?/Where will it end?/Seems like we are walking down these roads/For a while my friend/Morning please arise/Night time I do suffer” we believe it is coming from a genuine place. While it is technically a contemporary song, its appeal is a 100 percent throwback to the heyday’s of 1960’s soul to the purest degree.